The Ploughshare Mixer (or Plow Blender, Plow Mixer) is the so-called “aggressive” mixer that provides high shear force to the bulk materials during mixing operation, with the design of the plough (or plow) shaped agitators. These ploughs with sharp ends can easily penetrate through the dense and thick powder or paste materials. 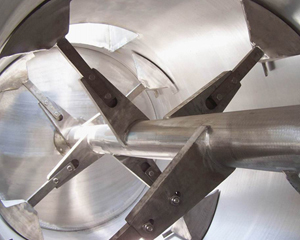 Ploughshare Mixers are so versatile that they are able to treat a broad range of materials as powders, granules, short fibers, moist solids, pasty materials, slurries and viscous masses. 1) NKM designs our Ploughshare Mixer which is able to achieve a maximum mixture ratio of 1:1,000,000, which means you can get the desired mixture proportion of components in as small as 1 gram with a batch of 1,000kg. 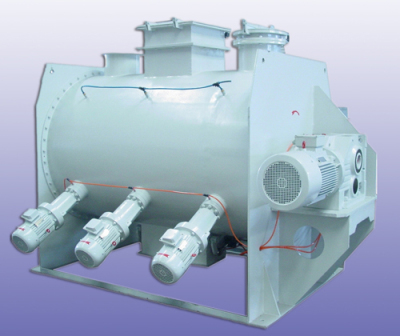 2) NKM is able to design the Ploughshare Mixer to be used as a reactor, dryer or deaerator, with the additional heating jacket, vacuum system, etc. 3) To handle the materials with lumps, extra choppers can be installed at the side of the cylindrical container to help breaking the agglomerates. Those choppers are operated by their own motors and can be variable speed controlled. 4) NKM builds our mixers with contact part by carbon steel, SS304, SS316L, Titanium, Duplex stainless steel, Hastelloy and others. For abrasive materials we offer Teflon coating for the contact parts, and chromium coating for corrosive materials. 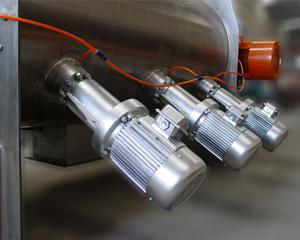 Also we build mixers all by stainless steel in order to meet the high hygienic requirement. 5) When it is required to add liquid during mixing operation, NKM offers spray nozzles on the top of the container. 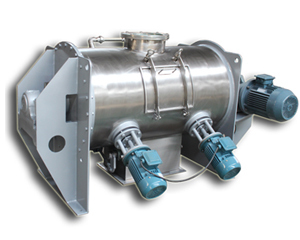 6) Discharge height of the Ploughshare Mixer can be specified according to customer’s request. 7) Quick opening access doors can be mounted for full access to the inner part of the machine, and thus for easy cleaning and maintenance. 8) ‘Bomb-bay discharge door’ can be used to discharge the finished product fast and completely, and minimize segregation during the discharge cycle. 9) When a large volume capacity per hour is required, NKM supplies Continuous Ploughshare Mixers for continuous operation, with the materials to be fed from the inlet at one end of the container, and discharged at the opposite end. The basic Ploughshare Mixer consists of a cylindrical container, a centrally mounted shaft attached with plough shaped mixing agitators, feeding openings at the top, a discharge valve at the bottom, complete drive unit and supporting frameworks. Materials are fed into the cylindrical drum either manually or automatically by a screw conveyor or pneumatic conveyor. 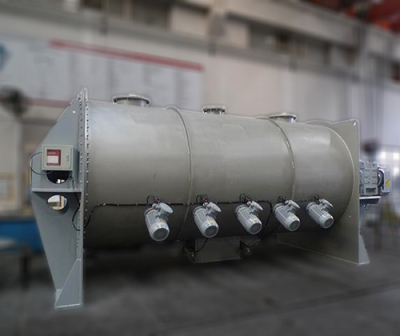 Usually, the Ploughshare Mixer has a feeding ratio of 50% - 60%, so there is sufficient space for the individual particles to be lifted and fluidized above the material body, and those particles are much easier to get mixed homogeneously and efficiently. After several minutes of mixing, the product is ready and can be discharged from the bottom valve, while the machine is still running. This will avoid any separation or segregation during discharging.